Why should I book my Glasgow airport parking in advance? If you're looking for the best deal, we advise you to book your airport parking as soon as you've booked your holiday. Save up to 60 per cent on the price you would pay if you just turn up at the airport. What security measures are there at Glasgow airport car parks? All Glasgow airport car parks have 24-hour CCTV, perimeter fencing and floodlights. All the car parks at Glasgow airport have been awarded the Park Mark for safer parking. That means that police officers regularly inspect the car park to make sure modern security measures are in place. What do I do on my arrival at the car park? The arrival procedures are similar at both Glasgow airport car parks. At Glasgow Long Stay, you take a ticket from the barrier and park your own car, making a note of what zone you park in. At Airparks Glasgow, park in an available space, unload your luggage, check in at reception and catch the transfer bus to Glasgow airport. How often do the transfers run and are they included? Transfers are included. Transfers to and from Glasgow Long Stay run every 15 minutes, taking 10 minutes. 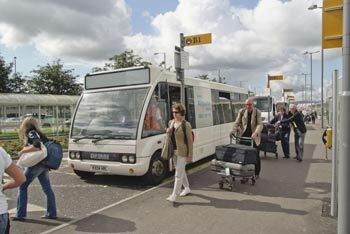 Airparks Glasgow transfers run every 20 minutes and also take 10 minutes. What do I do on my return to Glasgow airport? Take a transfer back to the car park. When you depart Glasgow Long Stay, present your ticket at the customer service office near the car park exit and then you can be on your way. If your car is at Airparks Glasgow, pop into reception with your booking reference to collect an exit ticket. You don't need to hand in your car keys unless you're booking Airparks Glasgow Return Greet. What is the Airparks Glasgow Return Greet? It's the same arrival procedure apart from handing over your car keys at check-in - and your car's parked for you. On your return, you would call Airparks from the freephone at Glasgow airport. A chauffeur would bring your car to the airport terminal, meeting you opposite the terminal building. What if I need to cancel my Glasgow airport parking? When you make the booking we will offer you a cancellation protection for just 99p, which will cover you if you need to cancel up until 24 hours before your booking is due to start. Although this doesn't apply to Supersaver bookings. Once Supersaver bookings have been made, they cannot be cancelled or amended. This will be made clear to you before you book, either on our website or by one of our travel consultants.